I looked out the window around sunset and noticed the moon was huge. The picture really does not show the size well but it was close to the harvest moon size. I took this photo out my second floor bedroom window, got to love eastern exposure in the morning! I would have headed out but it was -15c (5f) at the time, before wind chill, burr! Preheat oven to 350f. Cream sugar & butter together until fluffy. Add eggs and beat again until fluffy. In a separate bowl combine dry ingredients and mix. In another bowl at wet ingredients and mix. Alternate dry & wet ingredients into the butter mixture in 1/4's. Spoon batter into muffin tins lined with cupcake papers. Bake for 18-22 minute or until a cake tester comes out clean. Allow to cool before icing. Beat butter & cream cheese together until fluffy. Add icing sugar a bit at a time until it is all incorporated. Then add vanilla and continue to beat until the icing is aerated and stiff. Lets start with the onions shall we. It has been a week since I seeded onions so timing is perfect to do an update on their progress. I have some winners and losers that's for sure. The first seedling popped up within 3 days and the bulk of them came up between day 5-6. You may recall that 3/4 of my seed was from last year and thus germination on some has been pretty poor. 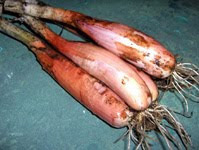 Here are the Red Long of Tropea onions that Daphne sent. They are germinating the best of all of them and are seed from last season. I planted 9 cells of them with hopes of two onions per cell and it looks like I will have many more then I hoped for. The one with the worst germination is the Armador shallots from last years seed. I seeded 18 cells, 5 seeds per cell and only have two seedlings. They are definitely a crop failure and will not be grown this year. Here are the Prince onions, also from last years seed. They have fairly good germination at this point, I would say 60%. I suspect within a few days more will germinate bring them to the crop levels I am looking for. These are the Amish Bottle onions and these are from fresh seed. They are germinating quite spotty but it is still a little early to rule out further germination. I am rooting for these as they sound very interesting. With the failure of the shallot crop I will need some replacements. I was sent a bunch of seeds to review from a US seed house that included some Spanish onions. I think I will replace the shallots with them and probably start another cell pack of the Amish Bottle onions. I am also playing with the idea of planting shallot sets in another part of the garden if I can find some for a good price. Shallots are nice to have around when you only need a little bit of onion and they are nice and sweet once cooked. Now for the early tomato. I was getting a little impatient with these but in the end every seed I sowed germinated. These are Siletz tomatoes and will hopefully bring an early crop of tom's to the garden. I think I will go for 3 early tomatoes this year, one seeded on Jan 21 and a couple seeded near the end of Feb. The rest of the tomatoes I am going to hold off starting until 6 weeks before outdoor transplant. Tomatoes just grow to big to have to many kicking around. Not much to harvest at this point, asides from a bit more romaine. The rest I will leave in hopes of a larger harvest in March. With nothing harvested I decided to show off meals I have made during the past seven days. They were all made with things harvested last Monday as well as some root crops I harvested a while ago. Mixed winter greens salad w/ beet, goat cheese & almonds. All veg from the garden. In behind is chicken parmesan. Mashed potatoes with spinach & chard from the garden. atomic red carrots turned much redder in storage as you can see. onion, cauliflower & brown rice. All the meals above were made with one chicken, garden & store veg and a few odds and ends. Overall the meals came in at less then a dollar per serving. I cut the breasts off for the chicken parm first. The carcass, legs & wings were made into stock with mixed veg. Then the chicken and dumplings was made with one leg, stock & biscuit scrapes. The other leg, wings & carcass meat combined with veg and the left over stock for the soup. Why I am on this topic is, I recently watched 'food inc' and they interviewed some folks who eat crap food because they say food costs to much. To them I say, you're full of it! I was surprised to see this mushroom growing this time of year. Coincidentally I just watched a doc. called 'Know Your Mushrooms'. watch it in parts on youtube. from the last time I took this shot. Little snow and lots of brown. sun creatures the light pink & blue colours at the horizon. year I have noticed this trees starts budding quite early. Last night, Jan 21st, I started the first seeds of the season. First up was all my onions which were started on the same day I started them last year, creature of habit. This year I am planting by the sqf instead of in rows which caused a bit of confusion at first. Daphne was kind enough to message that an onion every 4" is 9 per sqf not the 16 I was thinking, I can be quite dense at times... I have allotted just under 11 sqf for storage onions & shallots this year. Given a 4" spacing I will have room for approx. 98 onions, I hope... The shallots I will space closure then 4" so extra of them were started. This year I will be growing Armador F1 shallot, Prince F1 storage onion, Red Long of Tropea onion & Amish Bottle onion. All materials used were recycled from last year including the potting soil, cell packs, labels & tray. Most of my seed was from last year as well so I seeded five seeds per cell in hopes of growing two plants per cell. It is said that onion seed only last one year but I bet I will prove them wrong! With the seeds all planted and watered I placed them on my heat mat under the grow light. Now to play the waiting game. Last year it took 5 days for the onions to start sprouting, this year with the older seed I am expecting it to take longer. After the onions I decided to start an extra early tomato too. Last year I started an early tomato around Feb 14th and it produced an early crop. This year I am starting even earlier. 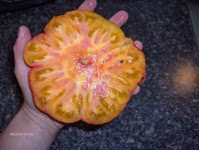 It is another Siletz tomato, it is determinate and produces red slicers in just 52 days. Maybe I will have fruit indoors before it even goes outside. First off the used potting soil went through my compost screen to remove all roots, leaves, maple keys etc. With that done, place the potting soil 4" deep in a roasting pan that is not used for food. Top it with foil to seal the moisture in and then insert a thermometer to monitor the temperature. Then the whole lot went into a 200f oven. Now monitored the thermometer until it reaches 170f, it took a good hour to heat to this point. Once at 170f hold the temp for 30 minutes which is long enough to kill off any nastiest and weed seeds. A few words of caution: One, it kind of smells, but not to bad. Like an earthy peat moss smell and it does not linger. Two, it is important to not heat the soil over 200f or it can create toxins that will kill your seedlings. Make sure to monitor the thermometer. Three, this only needs to be done for seeding, for potting up you can just screen the soil. All in all it was a pretty painless procedure and saved buying a $10 bag of seeding mix. fully develop. I hope to at least harvest something this spring however. small growth. I am hoping for some nice spring chard late March-ish. to compensate for the slower growth. Mizuna: This is the best performing crop in cedar poly tunnel. It has continued to grow in the cold, low light environment. Mache: they all have quite a bit of new growth just starting. Should make from some nice salads by March I hope. Spinach: They are showing more freeze & slug damage. the one that produces parsnip like roots as well as parsley leaves. Well there is the update on most things in the winter garden. I am hoping there will be good harvests coming during March. Then all the crops will have to start marking way for new crops during April. 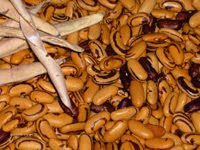 Tiger's Eye Beans: Large, flat, kidney shaped beans. Early producer, 80 days, bush habit. Monomakh's Hat Tomato: These were a freebie! 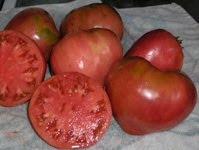 A russian variety, semi determinate, large 2lb fruit, 70 days. 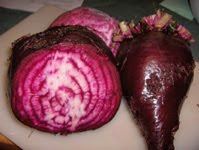 Deacon Dan Beets: Red/white marbled flesh, good storage beet. Grown by a deacon in Lancaster, Pennsylvania. Circa 1800's. Amish Bottle Onions: An extremely rare onion from Pennsylvania. Produces narrow, 6" long bulbs that keep well, good cooking onion. 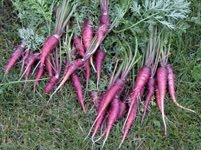 Dragon Carrots: Purple skinned, orange corred carrot. Nice sweet spicy taste. Second time grow these, they are excellent. With this order in I only have one left to make. It will be from Pinetree and I am hoping to get it done tonight. Once that is in and a few more seed trades I will be all stocked for the coming growing season. Our forecasted thaw arrived the last few days which got me out in the garden a bit. It has not been all gumballs and pixie sticks however, it has been rather grey and insipid out. Sunday I headed out into the cool fog with my snips to see what I could find for Harvest Monday. Pictured above is what I managed to find amongst the poor half frozen veggies. Almost looks like spring has sprung! My experience so far with winter veg is that from a distance they look quite awful and certainly not appetizing. But with a close look and selective harvesting there is lots of fresh, unscaved veg to be had. I noticed the plants have been putting on some new growth. I am hoping once the sun gets strong late feb maybe I will have more to pick from.